Phuket Wedding Studio by Number One Wedding, we have the most beautiful wedding gown and elegant tuxedo for rentals in Phuket. We stock over 100 of the newest and latest styles of bridal and bridesmaids gowns, bridal accessories and bridegroom tuxedo. 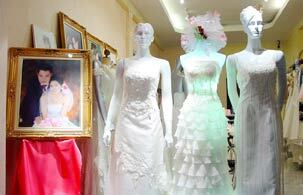 We provide an elaborate wedding dress both Thai and European style. for the most important day of your life a memorable one. Phuket Wedding Studio by Number One Wedding is an authorize dealer of Unibride, the embroidery is outstanding, created and developed hand embroidery with many materials such as lace, bead, cording and crystal from Swarovski. Unibride's gowns can show both strong expert designs and high quality workmanship. Unibride has qualified for " Thailand 's Brand" Certified Mark Project of The Department of Export Promotion of Thailand. If you are looking for wedding service please visit our showroom, call us or contact us by e-mail. we will be happy to take care all of your purpose.